We love seeing how the District ranks against other cities (not against entire states, thank you very much), especially when we come out on top. So here’s another first place trophy for DC: the best-designed city flag. Back in 2004, the flag experts of North America (called vexillologists) came together and voted on their favorite city flags, and DC was voted to have the best city flag out of all of them. We’re number one! Interestingly, in second place was Chicago, with a design that looks like they took ours, rearranged it, and added in another color. And even though we’re not a state, the good old DC flag also ranked as the eighth best state/provincial flag too. Anyway, we have a pretty cool flag. But where did it come from? And is it really based on George Washington’s coat of arms, as the legend goes? Or is it the basis for the original United States ‘stars and stripes’? This week’s Mythbusting gets to the bottom of the DC flag. First off, DC didn’t have an official flag for a really long time. It was founded back in 1791, and it didn’t have an official flag until 1938. During that in-between time, there were a number of unofficial flags, including the DC National Guard flag. Back in 1917, a guy by the name of Charles Dunn was compiling a book of state flags, and he noticed that there was no DC flag. So Dunn decided that DC should have a flag, and it should refer in some way to George Washington. But then Dunn got involved in the military and forgot about it for a couple years. Fast forward a couple years to 1938, when Congress finally realized that DC didn’t have a flag. So they ran a contest to see who could come up with the best design, and Dunn submitted a version of George Washington’s coat of arms. The Washington family’s coat of arms looks like this and can be traced back to before the 15th century. 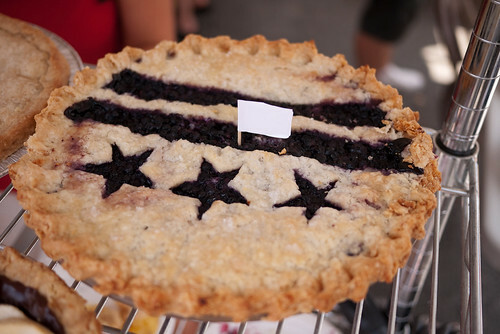 Dunn’s design won the contest (beating out another flag that sounds like it was ridiculously complicated: a large star, divided into thirteen parts and featuring the Capitol building, surrounded by 48 small stars). But even though DC adopted that official flag back in 1938, it wasn’t really used around the city for decades. The story doesn’t end there though. Up until the 1980s, most DC-government items featured the city’s seal (which features Lady Justice hanging a wreath on a statue of George Washington), rather than the flag. 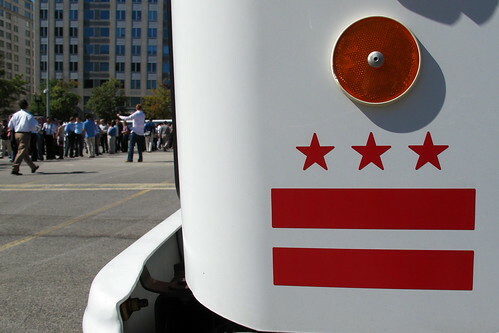 According to the City Paper in 1994, the DC seal was being misused in the 1980s– being drawn incorrectly, slapped on vehicles rather than being reserved for official city documents, etc. So the mayor ordered that the DC flag featuring the stars and bars would replace the seal as the symbol of Washington. That’s why you see it today all over the place on city vehicles and official materials. You also see the DC flag as a tattoo more and more, as it’s a pretty cool design that lets you show off your District street cred. In 2002, there was a movement to change DC’s flag once again. The new flag would include the phrase “Taxation Without Representation” while following the standard stars and bars design. The bill passed the DC City Council, but Mayor Williams didn’t sign it and it died. So, myth confirmed: DC’s flag is based on George Washington’s coat of arms. But it wasn’t around until way after the original US stars and stripes, and there’s no historical basis for how the Washington coat of arms influenced the creation of the federal flag, so that part is busted. Seeing as Chicago’s flag predated the DC flag by 21 years I don’t think Chicago “took” anything from the DC flag. Not to mention the meaning behind the Chicago flag is much deeper then DCs. Everything on the Chicago flag has a meaning. The DC flag is based on Washington’s coat of arms. I am sure, much like everything else in DC, even the vexillologists can be bought. Enjoy the spoils. Thank you. You have some good ideas.